The issue of the new Isle of Wight flag, designed by John Graney and voted for by County Press readers, has caused much discussion around the Island over recent months so we weren’t surprised to receive the following letter from Paul Sturgess. Seems to me this IOW flag is a big issue, we now have three. The new, the Council and the green and white, so what do we fly? Havenstreet Steam Rally saw five of the traditional style Green-White-Green flags flying around the show and camping ground, looks like since the new flag more people have taken to the old. 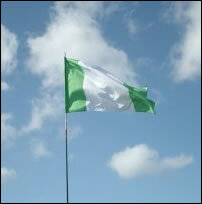 The Green-White-Green flag has now been nicknamed “The Isle of Wight flag the rebel green,” as can be found on Facebook. “Dull” someone once said to me. How can that be, when it shows the true colours of our Island with its green fields and a backbone of pure white chalk. Looks like the flag of Nigeria, SO WHAT, so do a lot of others, even the new. A flag is recognized by its colours and does not have to have symbols. There are none on the flags of Cornwall, Devon, the new flag of Dorset and many others too. As for Mr Bean (chairman of the Island Flag Committee) saying that others don’t use the flag of St George, this is not true. The flag of East Anglia, St Edmund, Alderny and Guernsey make use of it. So why can’t we? As long as I doesn’t have the outline of the Island or that cracked diamond in it looking like a fillet of plaice out of water. Or does that new flag sum up the Island. A dead Plaice out of water, but it does remind people of McFisheries. I think we deserve a much nicer flag with some good History. But Mr Bean is right in saying we cannot have a flag with the Union flag on it as this is defacing our countries flag. Maybe our Flag should be black with a diagonal white cross. One more thing. Do the people of the Isle of Wight know the number of votes for the new flag. We have the right to know. 15 Comments on "Ahoy The Rebel Green Flag"
Isn’t the Island-diamond a tad too Cowes-centric for y’all? I like the new Island flag and I think it’s a great design, so it gets my vote. I have one on my car. Why do we need a flag? We are part of England, part of the United Kingdom and therefore we should carry the United Jack flag. What’s a United Jack flag look like? Classic! Give the first and last images a ‘rebel’ green hue and I think we’re there! ‘ow’s about that guys and girls? Who does bother to buy a County Press these days?